Enric Botella is a young journalist who came of age in the digital era. In love with Barcelona, his native city, he worked the streets and created multimedia projects for the city’s public television channel. 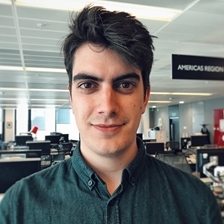 Since 2017 he has been with BBC News Mundo, the BBC’s Spanish-speaking service, where he runs innovation and video projects. He is a lecturer on the Universitat Oberta de Catalunya’s Master’s in Journalism and Digital Communication programme.